Trophy display cases show off your achievements. They protect and preserve awards, art and other fragile items. 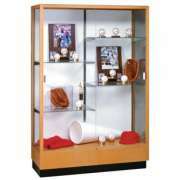 Our trophy cases enable you to showcase memorabilia safely without the risk of damage. They are perfect for game-winning balls, championship team photos, ribbons, diplomas and much more. Where should you display medals and trophies? 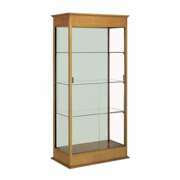 Show your pride in the accomplishments of your students or employees by placing their accolades in an attractive glass cabinet from Hertz Furniture. 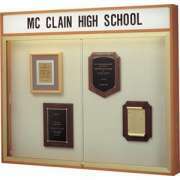 Visitors will be attracted to our elegant display cabinet, and impressed by your institution&apos;s notable successes. How do I choose a display cabinet? All glass cabinet options feature glass doors for easy viewing, but other materials vary. Hardwood frames and accents are great for a church, office or any professional setting. They offer an excellent way to enhance your lobby or waiting room. Aluminum-framed cases are optimal for schools because they can be coordinated to school colors. When achievements are framed in an attractive way, attention is drawn toward your institution&apos;s competence and exceptionalism. You can also choose from a selection of background materials. A mirrored background displays your prized pieces from every angle. If you choose a case with wooden accents, a wood background creates a coordinated look. What should I look for in a display case? 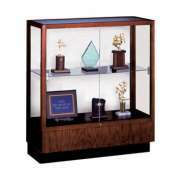 A number of features can greatly enhance your display cases. Locking doors are important because they protect valuable and sentimental items. With locking doors, you can display your pride without fear of damage, theft or lost items. Many of our units have a built-in lighting option. With illumination coming from inside the display unit, it is easier to distinguish important details such as faces in photographs or inscriptions on plaques and trophies. Where can I put trophies? 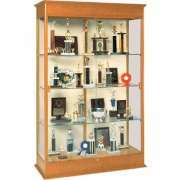 We offer a number of exceptional trophy cases from Waddell. Many of them feature adjustable shelves which can be arranged to suit whatever you want to put on them. 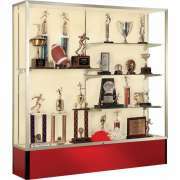 Spirit Display Cases are perfect for schools that want to showcase sports trophies, chess team plaques, all-star players and more. Their accent hues can be coordinated with your existing color scheme. What&apos;s the best place to display sculptures and mementos? Quantum display cases from Waddell feature curved tempered-glass doors and bright xenon lighting which illuminates contents. They are graceful and feature a glare-reducing black laminate backing which makes it easier to see contents clearly. They highlight brightly-colored items such as paintings, sculptures or artifacts. 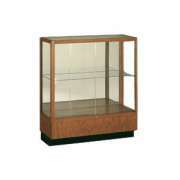 BestRite traditional wood display cabinets are perfect for formal settings such as offices or churches. They will fit right into a lobby, reception area or hallway. In addition to holding awards and diplomas, they can also be used for books and other items. They are available in a choice of classic wood finishes that can be matched to your office furniture. What kind of display cabinet should I get? 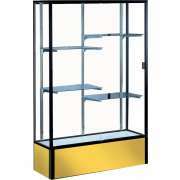 Display cabinets come in a number of different configurations. There is the classic freestanding rectangular design which is available in a number of different sizes and styles. Corner display cases are perfect for hallways or rooms where you need a little extra something, but don&apos;t have space for a full-sized case. 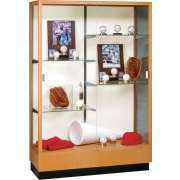 Tower display cases also enable you to showcase accomplishments even if you are short on space. How can I make space for a display cabinet? If you don&apos;t want to use up room on the floor, a wall-mounted unit is an excellent choice. 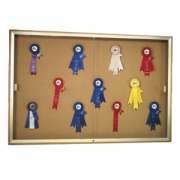 It offers a great way to highlight ribbons, awards and plaques and fits perfectly in a hallway or mounted prominently in an entrance area. You can choose either a cork backing or a plaque fabric back which is used with velcro. An optional illuminated header is available so you can put a school, church or company name on top. How can I make sure my glass case won&apos;t break? Anything that is made out of glass poses the potential danger of shattering, especially in a school where there are many children. 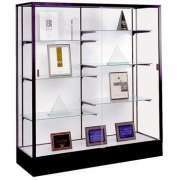 Most of our display cases feature shatter-resistant tempered-glass doors and sides. In the unlikely event that it does break, tempered-glass won&apos;t shatter into shards, it will break into small pebbles, which are significantly less dangerous. With an attractive trophy case from Hertz Furniture, you can elegantly display notable accomplishments in a worthy setting. A display cabinet projects a sense of institutional pride that will be appreciated by students, employees, visitors and clients alike. Interested in a display case, but not sure which size or style is best suited to your space? Call the Hertz Design Center today, and we will be happy to help you choose the optimal glass cabinet for your company, church or school.